The Old White Lion01535 642313work Restaurant - EnglishOur award winning Candle Lit Restaurant has featured in major food guides. We use fresh, seasonal and local produce. The Restaurant offers both an extensive A La Carte and set course menu (Table d'hote), catering for all diets. With a comprehensive wine list we are sure a choice can be reached to accompany any meal. Food served bar: Weekdays 11.30am - 2.30pm and 6.00pm - 9.30pm. Sat and Sun 11.30am - 9.30pm. Restaurant: Mon to Sat 7pm - 9.30pm. Sun 12pm - 2.30pm and 7pm - 9.30pm. Our award winning Candle Lit Restaurant has featured in major food guides. We use fresh, seasonal and local produce. Food served Bar: weekdays 11.30-14.30 & 18.00-19.30; Sat/Sun 12-21.30. Restaurant: Mon to Sat 19.00-21.30, Sun 12-14.30 and 19.00-21.30. From the M62 take junction 24 (Halifax), follow the A629 to Halifax and from the centre take the A629 (Keighley). After approximately 8 1/2 miles, at the mini roundabout, follow signs left to Haworth on the B6142. The Old White Lion is 1/2 mile past Haworth Station. Take the A1 to Junction 33 (M62 west), then at Junction 26 on the M62 take the M606 to Bradford. At the end of the M606 take the second left on the A6177 Bradford Ring Road on the B6145 to Thornton, then still on the B6145 to the A629. Take the A629 (Keighley) right to the mini roundabout and follow signs left to Haworth on the B6142. The Old White Lion Hotel is 1/2 mile past Haworth Station. From the South East take the M1 to Junction 42, then M62 to Juntion 26, then M606 right to the end of the motorway. Take the second left on the A6177 Bradford Ring Road on the B6145 to Thornton, then still on the B6145 to the A629. Take the A629 (Keighley) right to the mini round-about and follow signs left to Haworth on the B6142. 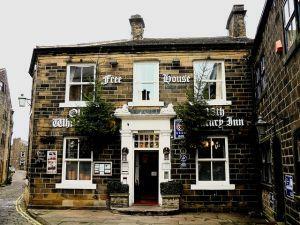 The Old White Lion Hotel is 1/2 mile past Haworth Station.